Liverpool was named by Rough Guides as one of the top ten destinations to visit in 2014. I did, and they’re right, it’s fantastic. Here are 10 things you definitely shouldn't miss. Liverpool really has become a centre for the arts. And it’s no wonder. All the galleries and many of the museums in Liverpool are free. Even if you are not an art aficionado, the galleries are well worth the visit. The Walker Art Gallery contains works ranging from the 13th century until today and contains pieces from artists you would rarely be able to see in Canada. The Tate Gallery, located in the Albert Dock area has a massive collection of Modern and Contemporary works. Did I mention admission is FREE? It’s already can’t miss…it’s FREE! Save the galleries for a rainy day. While I was lucky, apparently Liverpool can be quite wet! Yes, go to the mall. Located on 42 acres of land in downtown Liverpool, Liverpool One is a massive outdoor complex of the trendiest shops in England. The layout groups stores appealing to similar tastes and age groups together. For example, Fred Perry sits next to the Dr. Marten store. Don’t eat here. The restaurants are all crowded and a DIY attitude towards service. Venture towards Albert Dock to find more interesting fare. Don’t buy anything you can get at home. The exchange rate won’t make it worth it. Before committing your money to a designer’s boutique store, check out the department stores first. They will often have the same brands, but at a lower price. No visit to England would be complete without visiting a local pub. The atmosphere, food and locally brewed ales are uniquely British. Liverpool is home to well over 80 Pubs. My favorite spot was the 160 year old Peter Kavanagh’s. This dog friendly house features a cacophony of items covering the walls and overhanging the bar along with a great selection of ales on tap. It’s like walking into a scene from Coronation Street…complete with angry football fans. The Ship and Mitre was a very close second. Avoid the chain pubs. They have all the charm and warmth of a cafeteria….with food to match. Get the map. I was fortunate enough to run into a member of CAMRA (Campaign for Real Ale… seriously, it’s a real organization!) member who supplied me with a map of the best pubs in Liverpool. Carry this with you so you can find a place for a quick bite or a rest along your route. If Liverpool was a person, the Cavern Club would be its heart. 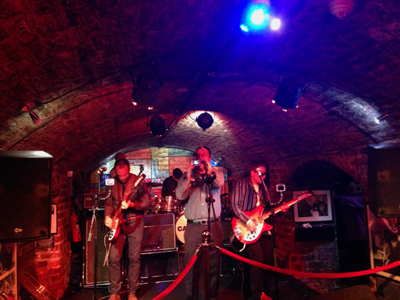 As the birthplace of the Beatles, the Cavern Club has become a mecca not just for Beatles fans but also for fans of up and coming local and international artists. Because of the Cavern’s worldwide reputation, you actually get the chance to see some pretty amazing musical acts living out their dream to play the Cavern. Plan to go on a Saturday night and you will be treated to a Beatles tribute band. There are actually three live stages. The Cavern Main Stage, The Cavern Club Back Stage and, located across the street, The Cavern PUB also featuring a live stage. There are plenty of chances to hear some great music. If the Cavern Club doesn’t satisfy your Beatles fix, embark on the Magical Mystery Tour (which also includes a free ticket for the Cavern Club). Starting from the Albert Docks, the tour takes you to the childhood haunts of the Fab Four and to several locations made famous through the Beatles music, like Penny Lane and Strawberry Fields. Don’t take a chance, book online. While most days you can purchase tickets for the same day, if a cruise ship is docked, you will miss out. Looking for a shirt that says “I’m a Beatles fan, but I don’t want John, Paul, George and Ringo plastered across my chest”? Purchase a Cavern Club Tee instead. As the place where the company that managed the unsinkable ship was headquartered, Liverpool and the Titanic have and will always be linked. The Merseyside museum’s comprehensive Titanic exhibition takes you from the building process, right through to its resting place in the Atlantic Ocean. Moving, without being overly sentimental, you will leave with a lot of information and more than a few goose bumps. The International Slavery Museum is located in the same building. Also free, this museum combines exhibitions, art installations and workshops that explore slavery and Liverpool’s formal role as an international hub in the slave trade. 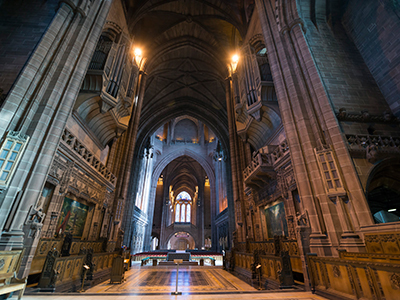 The Liverpool Cathedral is the largest in the UK and the 5th largest in the world and features some of the most unique features you’ll ever see in a Cathedral of this age – an organ featuring over 10000 pipes, a 331 feet high tower with an observation deck and even a freight elevator that emerges from the floor of the great hall. If you can manage the 108 stairs, then I suggest that you visit the top of the tower to take in some amazing views. On Thursdays, from March to October, there are also special twilight trips. Bring Binoculars. You’ll be the hero of your group. Word to the Claustrophobic. Obviously, don’t attempt the tower if you are afraid of heights, but be warned, the trip up also features two insanely small, sloooow elevators. Located along the Mersey, the Baltic triangle is home to a number of restaurants, nightclubs and shops, most of which are housed in converted industrial spaces. The Baltic Social’s interior can be described as putting the ‘fun’ in functional. But don’t let the simple DIY décor fool you – the food at the Baltic Social is phenomenal. We shared the small plate menu. At 3 plates for £11 you can sample several items while sticking to a budget. The Baltic has many personalities. Bistro by day, bar/club by night. Plan your visit based on your mood. The food is always great. If you find yourself in the Baltic Social at night, head over to the Camp and Furnace after dinner. Picture an indoor camp site located in a warehouse. Combining two of Liverpool’s most historically frequent cargos, the Superlambanana sculpture combines, wait for it, a Lamb and a Banana. 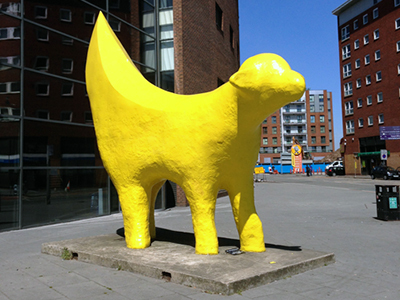 Originally created as a comment on genetic engineering, the Superlambanana has been embraced by the city, with several models located throughout the city. The original is located outside of Liverpool John Moores University. In every gift shop in town you will be accosted with Superlambanana paraphernalia. Give in…buy the salt and pepper shakers. After all, both go great on (non-genetically modified) lamb…not so great on bananas.